This app is so good. It helps a lot to not only track my period. But also my birth control. I am 49 so I am only using app to keep up with menstrual cycles and symptoms. It’s perfect for what I need and I highly recommend. I have been using this app for over 7 years (started with the free version then upgraded and paid for this version). It has always worked and I have had no issues. I like seeing the upgrades and improvements. Love this app. Helps me stay organized. I love this app! So much I bought the pro version, thinking there would be more wallpaper options with contrasting colors. A lot of the wallpapers have same colors in different shades so makes dates look same/together. Other than that great app! Love this app. Have been using it for years. I actually conceived on the first try the day i was ovulating. My daughter is almost three and I’m still using the app for my menstrual cycle. Never in my life have I used any type of birth control. I could never keep track of it myself. Love that you can get notifications too. LOVE THIS APP ITS NOT TO ACCURATE! AT LEAST FOR ME BUT IT KEEPS RECORDS WHICH I LIKE! Its very easy to use and has helped me out immensely. Thank you to the team. Love the app, def give 5 stars, it’s cute, customizable, easy to learn and understand, great graphics. You can tell a lot of work went into this app This app is call full of things you can track about your health, from sexual health to mental health to female health. It’s really impressive all the things they have thought to put in here and help me keep my health diary so I can refer back when need be. It’s been super useful. It also has fertility tracking and pregnancy stuff and I haven’t gotten to use those features yet but I’m getting married and will be soon. I have used this app for a few years. It works great. I give it four stars on my iPad. 1) It doesn’t use the health app. I did purchase the WomanLogS. I didn’t like it as much as this. I understand that does uses the health app. 2) It would be nice if some features could be turned off. Some Woman might no longer be concerned with having children. 3) It doesn’t zinc over my various devices for me. Other then them three issues. This is the best application I found to date on either iPad or android. Thumbs up. I have used this app for a few years now and thoroughly enjoy being on top of my cycle, I also have my daughter using it. We both suffer from very painful cramps. Knowing when our cycles start help us to manage the pain better. We have to start pain management prior to the pain hitting or it doesn’t work. This app helps with that. 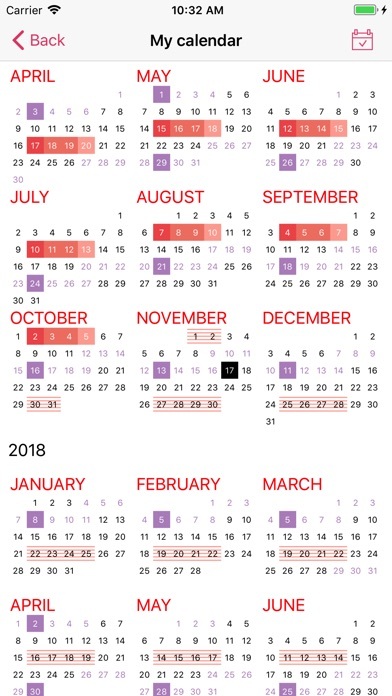 At one time my daughter would be out of school at least one day a month due to painful cramps, now that rarely happens thanks to this tracker. This app is incredibly helpful for keeping track of my cycle. I recommend it to anyone who needs to keep track of it. Really helpful. Five stars. Keep up the good work!!!!! Thank you. I have used it for about 7 years now and I don’t plan on switching. That is how good it is. Love the app. Helps to track cycles and input symptoms. Great for when doc asks for specific details, and I can’t remember. I just wished it synced to apple health app. Im using this app to keep track of my emotions/feelings throughout my cycle as I was having trouble understanding why I would get so sad for 1/2 weeks and it has help me understand around when that happens and how it’s shifts throughout the months. That’s all I use it for and to keep track of the length of my cycle. Helpful for that. I’ve been using this app for years and I love it! Tracks and calculates dates and symptoms easily! Does a great job! Seamless! It helps on so many occasions with my health and happiness.. helps me maintain my self awareness. Love this app! 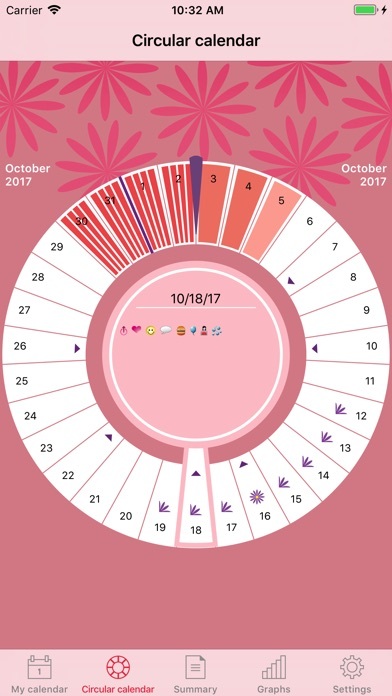 It was the perfect tracker of my period, my symptoms, and when I was ready to get pregnant the ovulation count worked perfect ! I’ve been using this app since 2013, I can’t say enough great things about it. I’ve had a lot of issues and this app helps me keep track of everything. A must have!!! Best app ever! Can keep track of so many things!!! Just wish it tracked the stages of the moon as well. Pro user for 7 years! 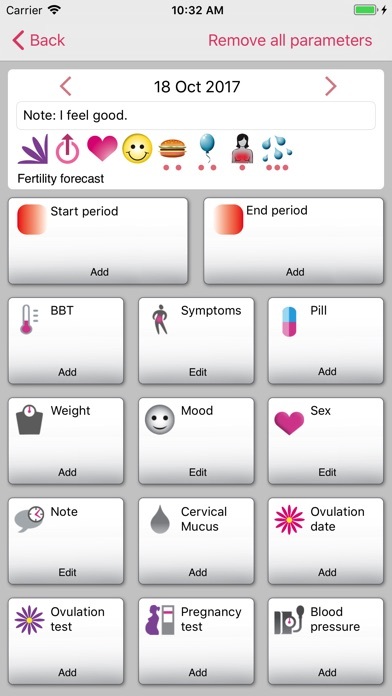 Having PCOS, this app is very helpful to keep track of not only cycles but symptoms. I am able to give my OB info without having to remember it all or misplace a written log. I do wish it had: integration with Apple Health a time entry with blood pressure a way to enter blood sugar Currently I use a different app for blood pressure and sugar readings. I’ve been using woman log for quite a while. Love it!! I’ve been using this app consistently for about three years and it’s perfect for what I need. The ability to add “symptoms” has made me more aware of my own body and has helped track my moods too! I really love this app. It is very helpful on tracking everything I need to remember for appointments. Been using this app for years and I love it. It pinpoints my cycle to the day. I have my daughter using it now too. Excellent app! It helps me track my menstrual cycle as well as symptoms, weight, sexual activity, and moods amongst other things. I have been using it for over 4 years. I’ve used this app for years. I track simple things like my period and my weight. I wish it integrated with other apps or even had a desktop version to study trends. But I have had it since I’ve had an iPhone which has to be like 5 years. Great app and paid for pro too. 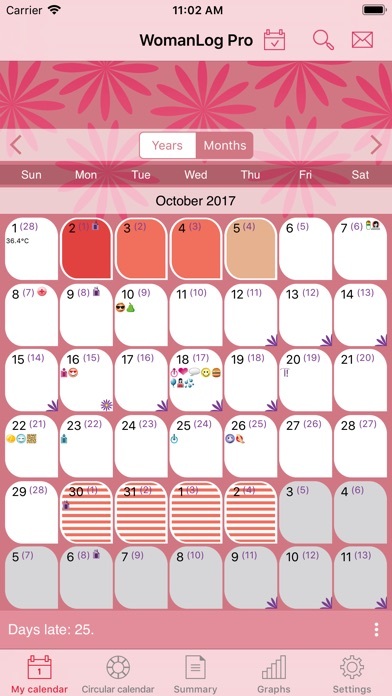 I love this app because it let monitor all the stages of my period, also in my pregnancies was very useful. It’s fool of details and data that let you notice any chance in your body, I recommend it! Had the free version but found that there is so much you can do with the paid version. 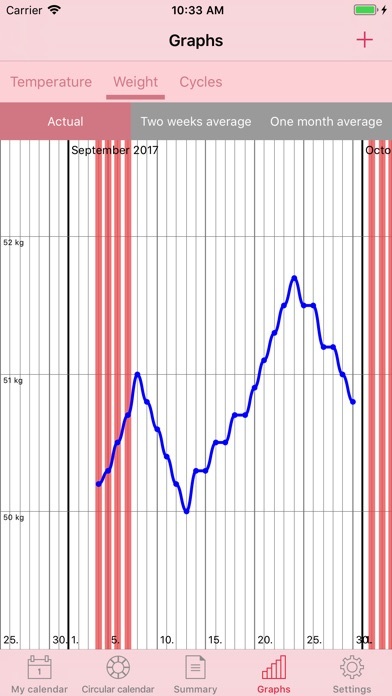 This app is great for tracking your cycle and knowing your “fertile” times. The only reason I’m not giving it 5 stars is because I had to set up my phone again and re-download my apps. Once I logged back in I quickly realized all my data from March 2018 until December 2018 was gone. I have an appointment in January in which I needed to show my doctor my dates. No I have nothing concrete to show her. Just be careful if you want to save your data, because it doesn’t automatically do it. The best period app out here. I’ve been using it since 2011 and it has always been accurate on everything. Love it! This is a great way to track a woman’s cycle. I also like the fertility calendar and the extra screen faces that you can choose. I’ve even got my teenage daughter using this app. Ive used this app for years! It’s awesome! Lots of features, it's worth buying. Don't forget to actually input the date you start your period even if it follows your forecast, otherwise it throws off the count off.